I have been SO inspired over the last few days! All of these amazing birth workers and doulas from around the world are celebrating the work of birth support. More and more individuals and institutions are starting to recognize the value of continuous labor support and it’s incredible to see. In fact, I was asked by the nursing honors society of DePaul University to speak to their nursing students and professional RN’s next month about my work as a music therapist in childbirth. Today they asked me for a short biography and some speaking points. Well for someone like me who wants to passionately share every detail about my work and experience, the term “short biography” is an oxymoron. So today, as a challenge to myself, I’m sharing my short biography for World Doula Week. Kate Taylor, MA, MT-BC is the owner of Creative Childbirth ConceptsⓇ which provides full spectrum pre and perinatal music therapy and birth services to all Chicago area families. Through this unique music therapy practice Kate also assists women in labor and delivery as a birth doula. Kate has advanced clinical training in providing Neonatal Intensive Care Unit (NICU) support, as well as applications of guided imagery, neurologic music therapy and end of life care. Kate draws upon her experience of the creative arts to deliver innovative childbirth education classes, music therapy assisted childbirth and unmatched personalized support for all families. Kate enjoys using creative writing, movement, music and art in birth preparation to help families be ready for birth and beyond. Kate also uses these creative tools to train and supervise other music therapists and birth workers including fellow birth, postpartum and bereavement doulas. Kate has presented her research at regional and national conferences of the American Music Therapy Association (AMTA), the Online Music Therapy Conference (OCMT) and the prestigious Association for Prenatal and Perinatal Psychology and Health. Kate Taylor has also had the honor of speaking at the World Congress of Breastfeeding through La Leche League International and on behalf of organizations like the Holistic Moms Network. More information about Kate can be found at www.birthmusic.net. Find her on Facebook at https://www.facebook.com/CreativeChildbirthConcepts, on twitter: @musictherapy4me or on instagram @birthmusictherapy. Categories: Uncategorized | Tags: #birthmusic, #worlddoulaweek, creative arts birthing, DePaul University, doula, family birth support, gentle c-section birth, gentle cesarean, labor support, music for birth, music for cesarean birth, music therapist, music therapy assisted childbirth, professional, School of Nursing | Permalink. What puts the “YOU” in DOULA? A few unique things about me as a doula. For today’s blog in honor of #worlddoulaweek I’d like to share a list of things about me that I feel make me unique as a doula. You know why I became a doula but now it’s time to see how I use my special gifts and talents to provide the highest standard of support for you (my clients) and for all my fellow birth workers reading this who trust me as your mentor. I am an excellent listener. I accept your feelings, physical and emotional. I support all of your feelings. I want the best possible outcome for you and your family. I can help you understand your choices. I will present you with all the facts and options. I can help you weigh the risks and benefits. I will not make a choice for you or attempt to sway you with my beliefs. I know when to let you be alone so you can do it on your own. I can help you understand yourself so you’re more aware. I bring out your creative side. I love music but know when to enjoy the silence. I see you not as mother, father, colleague, or friend but as human. I have the highest regard for your life and dignity. My continuous support can improve your outcomes. I will make every attempt to help you achieve your goals. My knowledge as a music therapist can greatly enhance your relationship with music and help you more fully embrace your experience. I am professional and trustworthy. I am authentic and kind. Categories: MTBC, music therapy, music therapy assisted childbirth, music therapy assisted childbirth classes, Uncategorized | Tags: birth doula, doula, family birth support, labor support, music, music therapy assisted childbirth, research | Permalink. Professional doula seeking supervision: serious inquires only. I’d love to see a series of “want ads” like this. Personal ads placed by professional doulas who are serious about their business of being a doula, aware of the depth of their work, seeking structured and professional supervision. Why would a doula need supervision? Deep focused Breathing. Feel your breath flow in and out. You’ve prepared for this surge in business. You’ve been trained, perhaps certified to handle the stages of labor and provide support throughout. You’ve honed your skills in touch and talk, bearing witness and reflective listening. You’ve advanced your business skills, done your market analysis and now you can warm chat the hell out of anyone. You know your ideal client. You’re booking 4 births a month and earning a living as a doula, doing your own taxes…Wait, my palms are sweating again. Some doulas may head into this level of “busi-ness” with eager anticipation only to get knocked back a bit when suddenly the births they’ve been so well trained to attend start to wear us down. Perhaps start to take over emotions a bit. It may start as a reflection of how beautiful a birth was, or how strong that mother was. Perhaps something happened that was different than what was “expected” and as a doula you witness something that hits hard. Maybe you witness a mother experience an unwanted intervention or a difficult transition and suddenly, you find yourself remembering it all.the.time. Feelings surface. Lots of BIG FEELINGS SURFACE. Now, I’m not saying all your feelings are negative or even as deep as a trigger for your own trauma. No, not all. But some maybe. Even just one emotion that still lingers as you read this. What if just that one feeling impacts you at your next birth? What if you have a hard time staying “present” because that one feeling is still part of your thoughts? I needed ongoing, structured and creative supervision in order to best fulfill my role as a birth worker. For me, the answer to my unspoken “want ad” for serious support came in the form of a colleague asking me to participate in peer supervision. After my first two hour online peer supervision session everything felt lighter. I felt more connected, creative and aware. My movement felt fluid, my work more manageable. My motivation had returned. My work had more purpose. This is why I offer structured, supportive supervision for doulas and other birth workers, music therapists and even consultations for parents seeking balance and mental wellness. I believe there is a need for confidential and competent supervision in the childbirth profession. I can relate to what you’re experiencing. I can offer you an assessment to help you determine what you may be experiencing. I can listen. I can reflect. I can try to understand and I can try to help you understand. I can offer you unique and creative ways of processing what you witness as a birth worker, what you need as a professional and where you’re headed in life as a doula. As a MT-BC, I adhere to a scope of practice and function under a code of ethics both of which consider the confidentiality of anyone I’m working with with the utmost importance and respect. Therefore, what you process with me, stays with me. What I offer is supervision, not socialization. So while I may be sipping a venti mocha while we engage in your supervision and the caring I offer feels like a trusted friend, I am not a friend. I’m a professional supervisor and you will be safe to share any and all reactions you have, judgements you make or feelings that surface from all aspects of your birthing business. Please contact me, Kate Taylor, MA, MTBC at mymusictherapist@gmail.com or visit www.birthmusic.net for more information. Online group services for pre and perinatal music therapists are now available through the exclusive PPMT Supervision Group co-sponsored with Interlude Perinatal Support Services. Email ppmtsupervision@gmail.com for more information about joining our next online series. Categories: creative resource for birth, Uncategorized | Tags: doula, music therapy, publications, supervision, support | Permalink. Add some MUSIC to your birth bag. If I had to name just one thing that made my daily life as a music therapist easier it would have to be music, of course. Music is a resource that can enhance most experiences, particularly childbirth. As leaders in health care, music therapists have demonstrated how accessible and enriching music can be for improving quality of life, rehabilitation and healing. As a doula and music therapist, I’m entrusted to bring the music to the birth environment. So every time my phone beeps or buzzes in the middle of the night, I make sure my bluetooth wireless speaker is charged, packed and ready to help deliver the most precious cargo in my birth bag….the music. First let me say, music for birth can come in many forms. I use my voice, my body, and at times various instruments through live musical interactions whenever appropriate, which can be often. Yet, most times during the labor and delivery stage, music enters the space as pre-recorded playlists. To deliver this experience I rely on a few important pieces of equipment. As a music therapist, the days of lugging around a giant case book of CDs, and a boombox bungee corded to my instrument cart are over. Music is more portable and higher quality than ever before. I use my mobile phone/ipod or tablet and streaming or downloaded music to organize and execute the applications of music. But without a speaker, much quality and application may be lost. So for the birth worker, music therapists and parents out there who may be seriously considering adding music to your birth plan, I’ll share a few specifics about the speaker I’ve had the most success with and a few reasons why it may be a useful tool for you to shape your birthing experience. 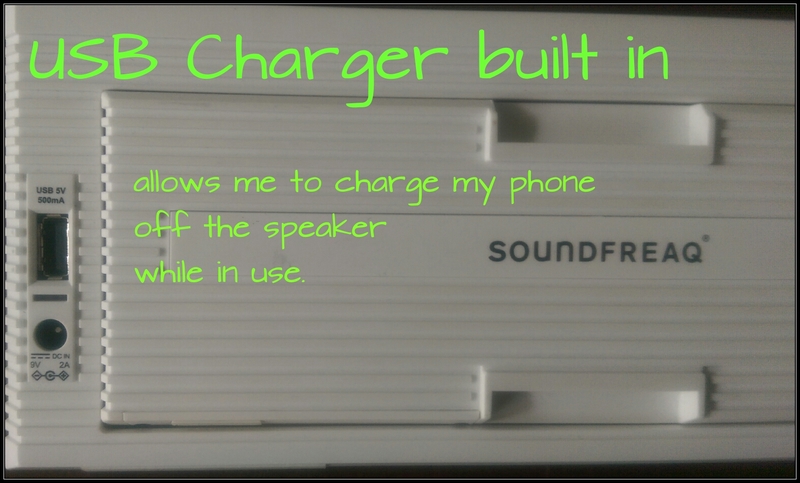 Currently I’m digging the portability and look of my SoundFreq Sound Kick speaker. It has just the right balance between size and sound and is an excellent travel speaker with charging capabilities, aux and USB ports. The website boasts 7 hours of charge time but honestly I’ve used it for nearly 10 without having to recharge. I do notice the bass sound to diminish a bit as the battery life is low. Usually I carry a USB led charge pack with me and as soon as that is connected, the sound quality seems to return to normal until I can fully charge again. The Sound Kick is designed with two 2.3 inch custom drivers and a XKICK™ chamber that pulls out of the back and supports the speaker. 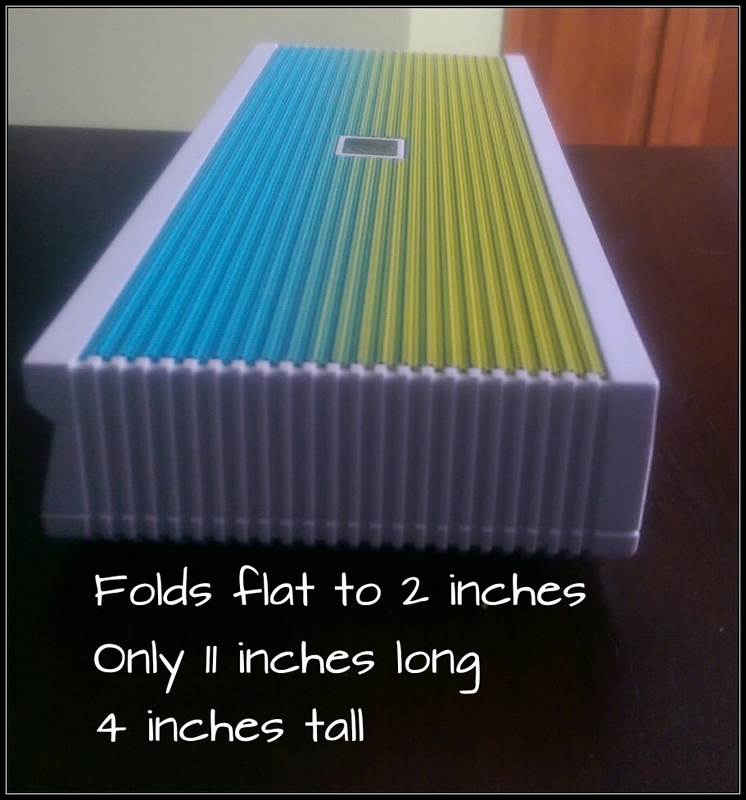 The expansion of this rear compartment at first glance appears to be a kickstand yet it serves a more important function to enhance the lower-frequency sound giving it a much fuller range than other portable speakers. I recently saw the Bose Sound Link Mini in action at a outdoor party and was impressed with it’s ability to cut through the party volume. However it seemed to almost challenge conversation at times. I think I might explore it due to it’s extremely compact size. 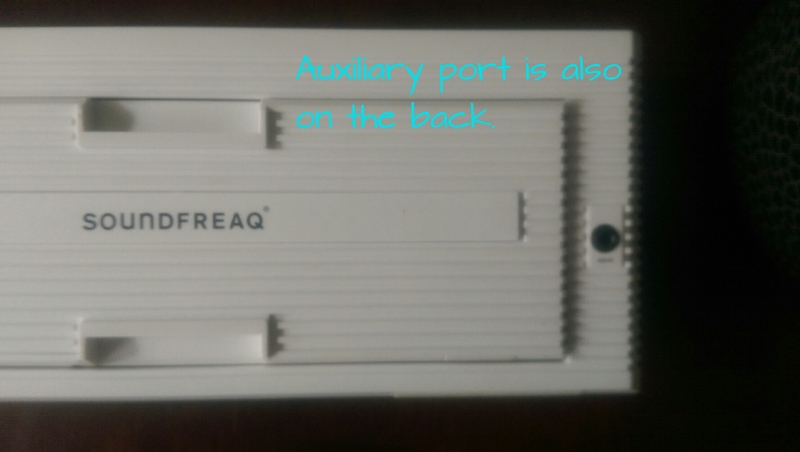 Yet, I hesitate that speakers of notable brand and portable mini size “disappear” more easily from the unit or birth place if left unattended. I tried for years to love the Sony SRSBTX300/BLK Bluetooth Wireless Speaker. But alas, I had to leave the relationship. The kickstand kept falling when on the hospital tray would wheel and it would turn off the speaker. The Sony bluetooth reception was spotty resulting in interruptions like a skipped CD and the weight is rather heavy for a birth bag. Doulas, as you know, every ounce counts when packing a bag to use while hauling a birth ball in tow. 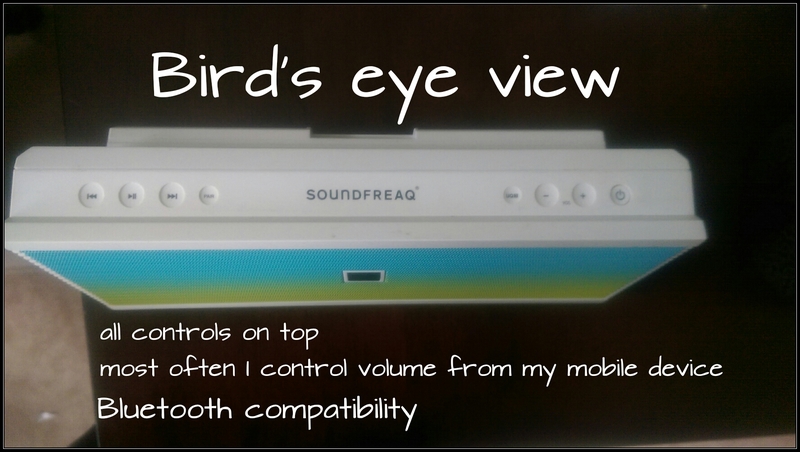 The size of the SoundFreaq Soundkick really is convenient and it’s weight is ideal. 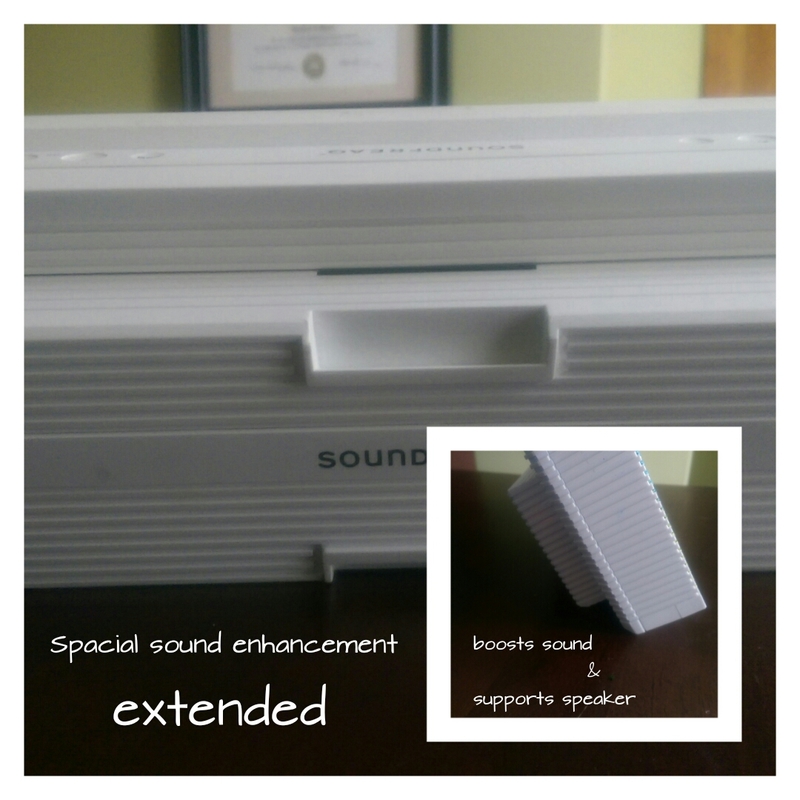 Music Therapists, you’ll also love how light and compact the Soundfreaq speaker is. I’ve always been able to discreetly set it up on the window ledge or bedside table at birthing centers. I have even slipped the speaker and ipod into the pocket of a dad’s scrub attire as they headed into an emergency c section birth (with his permission of course). I love the variety of reactions I get when I pull out the speaker in prenatal visits too. In fact, one time during a prenatal education class, I pulled out the speaker, popped up the sound chamber a husband reacted with wide eyes and nervously asked, “what is that? !” He admitted he was scared it was a contraction stimulator and that I was planning to hook him up to it for childbirth education class. (Apparently, he’d watched too many youtube videos). Needless to say, he was relieved when the speaker started playing his wife’s favorite Latin tunes, instead of stimulating contractions on his abdomen. Often when I set up the speaker, I get some oohs and ahhhs as well. Not just because of the speaker’s quality of sound, but it’s unique in aesthetics. You see, I have branded my business with two colors: a bright fresh green grass color and a soothing teal/aqua. Conveniently for me, the speaker comes in these amazing chromatic colors called Ocean (seen here), Sunset and Twilight. Nurses have come to recognize my speaker in the birth rooms and associate it the effects of the music therapy assisted childbirth. It just so happens that colors also affect our mood, memory and help with identity branding. So browse the variety of colors and styles offered by SoundFreaq speakers and see what fits your brand and the mood you wish to create in your birth place. Categories: birth music, birth plan, creative resource for birth, doula bag, doula tool kit, music therapy, music therapy assisted childbirth, prenatal music | Tags: birth doula, birth tool kit, c-section, csection, doula, environmental music therapy, family birth support, labor support, music, music for birth, music therapy assisted childbirth, music therapy for childbirth, SoundFreaq Sound Kick, speaker review, your doula bag | Permalink.